Green T uses TREE-äge® Systemic Insect Control to combat Emerald Ash Borer providing a cost-effective and eco-friendly treatment solution. 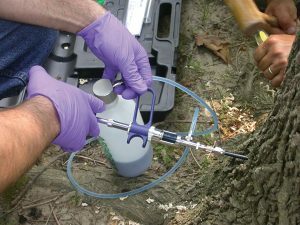 It is injected directly into the tree’s vascular tissue using a drill-plug-inject method to assure even distribution and consistent results. For best results treatment should be repeated yearly. Contact Green T to request a quote and begin treatment on your Ash tree today! Why should I treat my Ash tree? These are just a few reasons why seeking treatment for your Ash tree is important. View the Tree Benefit Calculator to estimate the full value your tree provides you.